Next year on November 6 it's time for general elections in the USA but the political campaign work in both parties has already begun. At the moment it's the Republicans and their primary that is in the prime spotlight. The 2012 Republican primary seems to shape up with three main potential contenders against Barack Obama and the Democrats. These three front-runners are Mitt Romney, Michele Bachmann and Rick Perry. But what does Romney, Bachmann and Perry say about environmental and climate issues? Below is a quick summary on the three front-runners and just where they stand politically when it comes to the climate and our environment. As a quick note before I start I must say that it's sad to see that the American climate debate has taken a completely wrong direction since the last elections. The former Republican Presidential candidate John McCain, who proudly said he was a "coal booster" and his (joke to a) Vice President Sarah Palin who in the elections couldn't even name a single man-made cause to climate change, supported a cap-and-trade system in the previous election. But none of the three Republican front-runners would today even consider a cap-and-trade system in the US. And somehow Rick Perry's and Michele Bachmann's rhetoric sounds remarkably similar to the Norwegian terrorist's crazy ramblings about climate change being some sort of "eco-Marxist plot". It is also sad that Mitt Romney is facing such strong criticism among Republican voters for his (weak) pro-climate and pro-science stance. It shouldn't be "political suicide" to believe in basic climate science these days. 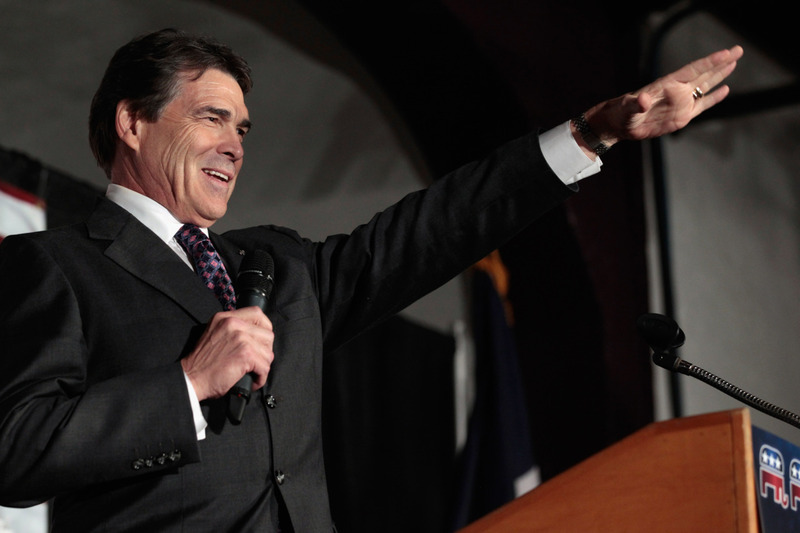 Rick Perry is an religious, right-wing conservative who currently is the Governor of Texas. Many political commentators have likened Perry and his cowboy-like rhetoric and style to the former President George W. Bush. Which might say a lot where he stands political on environmental issues considering Bush's awful climate record. "For example, they have seen the headlines in the past year about doctored data related to global warming. They know we have been experiencing a cooling trend, that the complexities of the global atmosphere have often eluded the most sophisticated scientists, and that draconian policies with dire economic effects based on so-called science may not stand the test of time. Quite frankly, when science gets hijacked by the political Left, we should all be concerned. . . .
And it's all one contrived phony mess that is falling apart under its own weight. Al Gore is a prophet all right, a false prophet of a secular carbon cult, and now even moderate Democrats aren't buying it." When Perry campaigned for Governor in Texas last year he was labeled as one of the twelve dirties state office candidates in the country by the Texas League of Conservation Voters. "Rick Perry has consistently put corporate polluters and other special interests ahead of protecting our natural resources and working to make Texas a leader in the new clean energy economy," said David Weinberg, Executive Director of the Texas League of Conservation Voters. Jonathan Hiskes wrote a longer summary about Perry's environmental record last year saying that while Perry fights climate action he embraces wind power. He also writes that Perry "relishes his role as a foe of national climate action" and that he have said that the climate bill that passed the House in 2009 was as an "economic disaster". Perry has also tried to fast-track permits for 11 new coal plants in Texas. "Since his 1998 candidacy to be George W. Bush's lieutenant governor, Perry has raked in $117,091,642 in campaign contributions, with the oil and gas industry the top contributor. Big oil has fueled Rick Perry's career, the top industry contributor at $11,189,103, according to the National Institute on Money in State Politics. Top oil company contributions include $189,188 from Exxon Mobil, $147,895 from Valero Energy, and $116,000 from Koch Industries." "The other day, Texas Governor Rick Perry took dramatic action to save his state from the ravages of a changing climate. He issued a proclaimation for Days of Prayer for Rain in the State of Texas. For three days, Perry asked Texas to kneel at the pew, or at the foot of their beds, and silently ask God to bring water to their parched state." When it comes to EPA Perry says the Environmental Protection Agency and their regulations "are killing jobs all across America" and that he wants the president to "put a moratorium on all regulations across this country." And like ThinkProgress notes, this would mean complete anarchy and a literal end to the rules of law in the USA. Michele Bachmann is a congress member in the United States House of Representatives and a strong supporter of the populist, right-wing Tea Party movement. Bachmann is, similar to Rick Perry, a conservative right-winger who is supportive of corporations and doesn't like environmental regulations. She is also a climate change denier. "What we need to do is pass the mother of all repeal bills, but it's the repeal bill that will get a job killing regulations. And I would begin with the EPA, because there is no other agency like the EPA. It should really be renamed the job-killing organization of America." "I pledge to you I'm not a talker. I'm a doer," she said. "[...] And I guarantee you the EPA (U.S. Environmental Protection Agency) will have doors locked and lights turned off and they will only be about conservation, " she said earlier today at a campaign stop in Cedar Rapids. "It will be a new day and a new sheriff in Washington, D.C."
"I want people in Minnesota armed and dangerous on this issue of the energy tax because we need to fight back. Thomas Jefferson told us 'having a revolution every now and then is a good thing,' and the people - we the people - are going to have to fight back hard if we're not going to lose our country. And I think this has the potential of changing the dynamic of freedom forever in the United States." One can wonder that if by "armed and dangerous" Bachmann meant something along the lines of what the Christian right-wing terrorist succeeded with in Norway this summer? 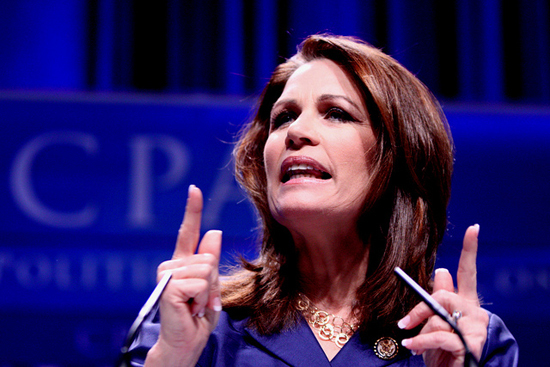 When it comes to climate change Bachmann is just like Rick Perry a global warming denier. During a debate at the House floor on Earth Day in 2009 she claimed that "carbon dioxide is a natural byproduct of nature" and that this would somehow disprove man-made climate change. "The big thing we are working on now is the global warming hoax. It's all voodoo, nonsense, hokum, a hoax..."
Bachmann also supports oil drilling in the Arctic National Wildlife Refuge (ANWR) saying the federal protected area would be "perfect for drilling" and that "it beast Saudi Arabia". But allowing oil drilling in the ANWR is pretty mainstream Republican opinions. Republican John Boehner, who is currently the Speaker of the United States House of Representatives, said in 2008 while pushing for oil drilling in the area that he didn't believe that there is any wildlife at all in the ANWR. Mitt Romney, the former Governor of Massachusetts, also wants to see oil drilling in the Arctic National Wildlife Refuge (ANWR). 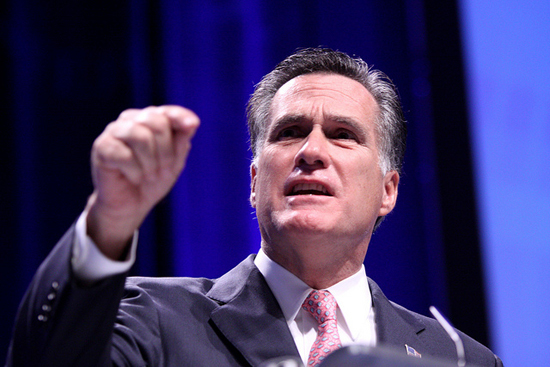 During a GOP debate in 2007 Romney said that to be able to reach energy independence USA needs to increase all their domestic energy productions. This would include investing more in nuclear energy and "more drilling in ANWR." But in just a few short years, Romney's cap-and-trade feelings shifted. "We're going to move our new facilities from the U.S. to China, where they don't have those agreements. You end up polluting and putting just as much CO2 in the air because the big energy users go there. That's why these ideas make sense, but only on a global basis. They don't call it 'America warming.' They call it 'global warming.'" "I believe the world is getting warmer, and I believe that humans have contributed to that," he told a crowd of about 200 at a town hall meeting in Manchester, New Hampshire. "It's important for us to reduce our emissions of pollutants and greenhouse gases that may be significant contributors." "But Romney also says he's not sure how much the globe is warming or how much responsibility humans bear, or what exactly the best climate policies would be. That's not exactly a bold, maverick stance, and would seem to put Romney within the same ballpark on the issue as George W. Bush." ""Gov. Romney does not think greenhouse gases are pollutants within the meaning of the Clean Air Act, and he does not believe that the EPA should be regulating them," said Romney spokeswoman Andrea Saul. "CO2 is a naturally occurring gas. Humans emit it every time they exhale." Last week, Romney responded to a question at a town hall meeting in Derry, N.H., by saying he doesn't think carbon pollution threatens public health or merits regulation under the Clean Air Act." So while Romney at least acknowledges climate change he is still unsure about it and has no real plans or ideas on how we can combat the climate crisis. Last week in Iowa, Romney said that "corporations are people, my friends." So it seems we shouldn't put much hope to Romney that if he gets elected as president he would enforce environmental regulations against his friends, the corporations. Simon, LOL, love the picture of Rick Perry at the top, pretty much sums up his policies! Bet his trolls will be decending on you for that soon! The question I have to ask is are these guys actually serious about their policies, or is it all just a big act they are putting on? If I was a power hungry meglomanic running for the Republican nomination I'd probably say I was against science, gays, nature, foreigners, mime artists, high taxes, etc. and in favour of high government spending, fossil fuels, creationists, religion guns, guns guns! focus on the family and the children, the children, will somebody please think of the children! Indeed I'd probably go even further and threaten to nuke the Whales and invade France and nevermind creationism I'd express my views on a flat earth, and my positive attiude as regards imbreeding . And yes I know i've just contradicted myself several times there, but most of the republican base don't understand irony, hence how they can be against abortion yet in favour of capital punishment, in favour of religious freedom and the right to own undocumented firearms, but want the government to stick its nose into people's private lives or snoop on people big brother style. Obviously once the nomination is in the bag, I can chill out and try to paint myself as the White Obama. If that annoy's the Republican base, well they can go throw their vote away and vote for Ron Paul, or just go whistle Dixie So again I ask are they really this insane or is it just an act they are putting on to get the nomination? Unfortunately manyÂ environmentalist are stuck on just Global warming. Â Â Water and air are both contaminatedÂ by shipping. Ships burn cheaply refined fuel which means more deadly emissions and ballast water includes invasive's such as human bacteria and virus. Â EliminatingÂ China'sÂ needÂ toÂ import oilÂ from South AmericaÂ with a dirty water trail and carbon footprint,Â using itÂ inÂ manufacturing whileÂ hidingÂ emissions, before shipping foreign goods into America with another trail of pollution, would helpÂ slow global warming. Â Â Â Â Whether you believe in global warming or not, the moral issue is pollution with pathogenic material. Pathogenic materials cause disease and KILLS PEOPLE, both in water and air. Allowing foreign ships bringing foreign made goods into America, to discharge pathogenic material in both ballast water and air emissions is putting American health at risk and steals American jobs so foreign shipping can save money. The Federal government is not capable of addressing the problem because our leaders have created an America dependent on a communist country and their control of the global economy for both consumer goods and finance of entitlements. This provides service jobs in the big box stores of foreign made goods, that have become our largest employers. We need a president who cares more about the future of our children's health and providing quality jobs to create the American dream, rather than the building of a global economy to quickly increase job numbers with low paying service jobs. Strong environmental protection requiring mandatory environmental technology installation for foreign ships in American waters would keep Americans safe and help create cost competitive manufacturing jobs . Kinda stupid to acknowledge something that doesn't exist. Heck, the global warming alarmists are so embarrassed that there is no global warming that they call it something else now--climate change. Different name, same nonsense. Are you a denier of Climate-gate? Do you deny that the warmest year on record was 1998? Duh, it's been 13 years, where's the warming? Do you deny that the planet has been progressively cooler each yearÂ beginning with 2003? Who's the denier?Â How 'bout helping the environment by dispensing with the phony leftist agenda and concentrate on limitingÂ the things that are actually hurting the environment. Go Bachmann!!! That's a good question. I would say it depends from candidate to candidate. In this post I've only covered where they stand on environmental and climate issues. I haven't talked about their other (scary) political views on abortion, homosexuals and so on.Â Personally I think Bachmann is actually this crazy, which is kind of sad considering she is the only female candidate (no, I am not counting Sarah Palin). It's interesting to note that in 1988 Rick Perry actually supported Al Gore's presidential campaign.Â But among these three candidates I think Mitt Romney actually fits the best with your comment. He has "flip-flopped" the most on the climate to satisfy the anti-science fringe in the Republican party. I would say it's pretty stupid to deny climate change considering the fact that 97% of climate experts agree humans are causing global warming. "Are you a denier of Climate-gate?" Are you deniers still talking about "climategate"? An independent inquiry set up to investigate the climategate affair came to the conclusion that there was "absolutely no evidence of any impropriety whatsoever." Lord Oxburgh said that "whatever was said in the emails, the basic science seems to have been done fairly and properly". End of story. "Do you deny that the warmest year on record was 1998?" "Do you deny that the planet has been progressively cooler each year beginning with 2003?" Empirical measurements of the Earth's heat content show the planet is still accumulating heat and global warming is still happening.